DogBedDepot 30 Day Satisfaction Money Back Guarantee! Same Materials As Found In Expensive Human Beds. Brown Removable, Washable 180 GSM Microfiber Cover & Waterproof Internal Cover. Provides Relief From Pain Associated With Arthritis, Muscle Stiffness or Hip/Elbow Dyslapsia. Stop Replacing Your Dog Bed Every Few Weeks. Are You Tired Of Replacing Your Dog Bed Every Months Or Even Few Weeks? DogBedDepot is proud to introduce the Paddy Bed durable orthopedic memory foam dog bed. 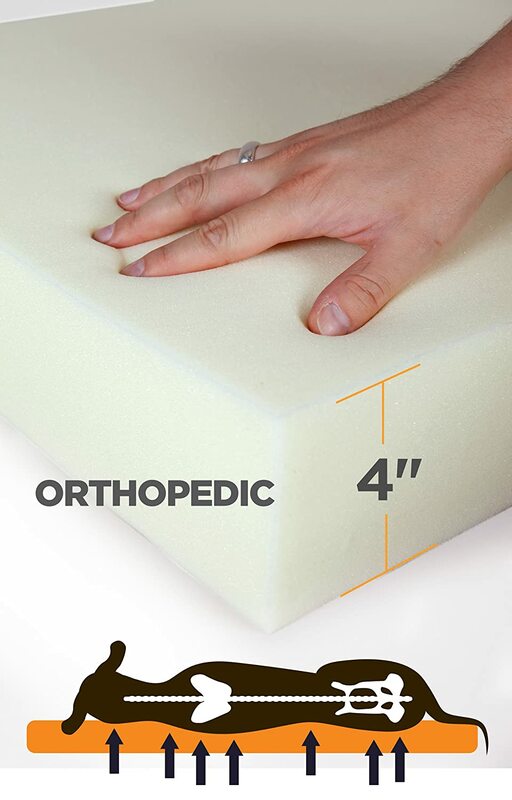 typically use a 3 or even 2 pound piece of memory foam that will eventually bottom out. Why Should I Buy A Paddy Bed Memory Foam Dog Bed? * Paddy Bed uses a 4 pound memory solid piece of memory foam designed to last under normal conditions. * Attractive Coffee Brown removable, washable 180 GSM external cover. * Waterproof internal cover protects memory foam from liquid or gel spils. * Non-slip bottom keeps your dog bed in place. * Relieves pain from arthritis, muscle stiffness as well as hip or elbow dyslapsia. * Uses same materials as human beds costing in excess of $1800. * Memory foam technology contours itself to your dog's body relieving pressure points. * Mildew & mold resistant. * Large size dog bed holds dogs up to 160 pounds. Customer satisfaction is our priority. The DogBedDepot 30-Day Money Back Satisfaction Guarantee. purchase simply return product to Amazon within 30 days for a 100% refund.